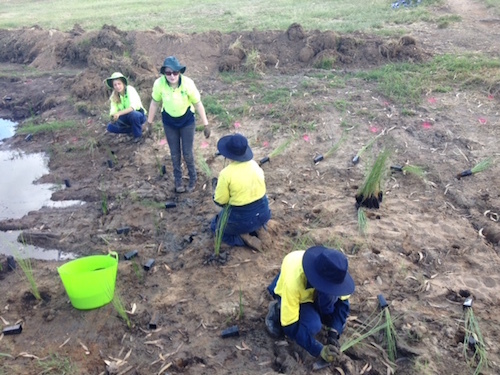 This week we had our first planting as part of the partnership between our catchment group, Green Army and Boonah Motocross. 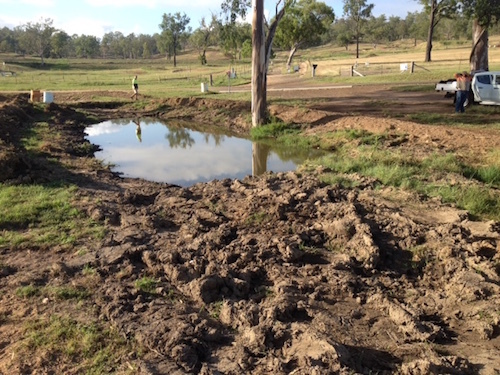 The funding for the project has been provided by Motocross Queensland. B4C is providing the planning and work for the natural environment. Catchment Manager Wayne Cameron says the partnership aims to lessen the motocross environmental impact while at the same time improving their landscape and facilities. “We’re bringing back natural vegetation to provide shade, landscape amenity, wildlife habitat and environmental corridors,” Mr Cameron says. “Erosion and sedimentation is a huge issue for motocross clubs and we believe we can address this issue through landcare activities. 260 plants were planted including a full aquatic planting within a sedimentation pond. The plan is to create a whole riparian corridor leading from the pond along the waterway, currently devoid of native vegetation. The Green Army will be planting 120 tree riparian corridor in the coming weeks. The below video gives you a view of the area the partnership is working on. We will be bringing you some progress vision in coming weeks. Boonah Motocross, Green Army, motocross, Motocross Queensland.